Trinidad and the Valley de los Ingenios are linked because of the sugar trade, which resulted in Trinidad's prosperity in the 18th and 19th centuries. Trinidad was founded in 1514, and became a bridgehead of the conquest of the American continent. It was a departure point in 1518 for Cortéz. The town had a largely Spanish population. Nowadays it is one of the best preserved cities in the Caribbean from the time when the sugar trade was the main industry in the region. Many stone buildings from that period survive, including impressive public buildings and single-storey domestic houses with verandas and multi-coloured walls. The Valley de los Ingenios (Valley of the Sugarmills) is a series of three interconnected valleys about 12 kilometres outside of Trinidad. The San Luis, Santa Rosa and Meyer valleys were a centre for sugar production from the late 18th century until the late 19th century. A large number of slaves were employed at the sugar plantations. Sugar mills such as Manacas-Iznaga, San Isidro and Palmarito remain, as well as a few villages of craftsmen, plantation houses and slave quarters. 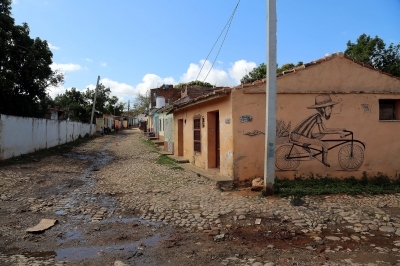 Trinidad is one of Cuba's most iconic destinations. It attracts hordes of tourists into its small, well-preserved city center. If you stay overnight, and it is valuable to do so because of the various things to see in the surrounding area, you'll enjoy its oldfashioned tranquillity in the early mornings. Dogs going for a walk on their own, street sellers roaming the streets with milk, bread or cheese, the soft ticking of horse hoofs. The town has a couple of picturesque sights. The large yellow bell tower for example. It can clearly be seen, like the rest of the small colourful houses, from the roof of the museum. The day I was there, a kind of ash cloud blowing in from the countryside covered the city. While eating my breakfast on the casa's patio, tiny strips of black ash started to cover everything. A common occurrence here, so I heard. At inscription, Unesco casted doubts over safeguarding the industrial architecture that remains from the sugar period. I went to see for myself, and used the tourist steam train to get into the so-called Valley of the Sugarmills. Most remarkable: there's almost no sugercane left! The landscape is quite pretty, but not what I had expected. Scattered in the valley some industrial heritage still exists. The main site is the former Slave Tower at Iznaga. You can still climb up to the very top, and look out 360 degrees like they did to watch the slaves. I cannot say that there is much more to explore. The village has made the best out of the daily load of train and bus tourists, and is selling embroidery. Visited this site in May 2018. 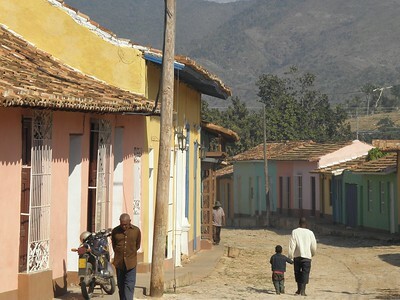 Trinidad is super star attraction of Cuba. As for me, this was really the most authentic town with earliest clocks stopped in my life (ignoring Pompei, of course). Trinidad has accumulated its fortune thanks to booming sugar mills in the neighboring Valle de los Ingenios. Cobblestone streets are leading to the central square with Iglesia Parroquial de la Santissima Trinidad (and internet catching crowds on the steps). While strolling the streets you could glimpse into the old houses and see the pictures from real life of the locals watching TV, relaxing or chatting with each other. Tourist crowds make sure that Trinidad is also packed by cozy cafes, interesting art galleries and classic Cuban music venues, including Casa de la Musica and Casa de la Trova. We enjoyed Trinidad and this is certainly top site with three Heritage Michelin stars. Very atmospheric place. I visited Trinidad in 1990 while staying at a resort several kms away. I went into town on a motor bike with a group and a local guide. The small town was pretty and painted in pastels. The local people were friendly. It was a pleasant place with lots of flowers and singing birds in cages in front of people's homes. Quaint and worth an hour or two at most. Trinidad is like walking back into time. The city centre is characterised by low rise houses and small cobble stone streets. No cars are allowed in the centre, making it sometimes surrealistic to walk around in this city, adding much to this back in time experience. You wake up with the sound of people selling bread and milk, the chickens looking for food and a cow pulling a cart. Of course Trinidad has some cigar factories and a Casa de la Musica. In the evenings the square in front of the Casa is the centre of entertainment: the old city, music, dancing, cigars and rum all blend into this incredable atmosphere. Trinidad can easily be reached by bus. Viazul is very reliable (in 2001), but the busses are extremely cold since the airconditioning has only one grade: feezing. Slavery: The ICOMOS document states "In 1827 there were (total population) 28706 of which 11697 were slaves working in the 56 mills"
Sugar: Valley de los Ingenios: "a living museum of the sugar industry featuring 75 ruined sugar mills..."
155 Community Members have visited.